Makarenko A.V. is a qualified lecturer from MGIMO, with a profound knowledge of Russian and the European Union economics and the history of economics. 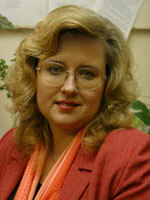 She is the author of the publications on the government regulation and economic policy. She has vast experience in working with students. Every year she takes part in organization of scientific students’ conferences on the theory of economics and the history of economics in MGIMO. As a person responsible for different innovation projects she acquired good professional skills.